Adorable! Gorgeous fabric, beautiful pattern on you, great finishing inside. Love it all. 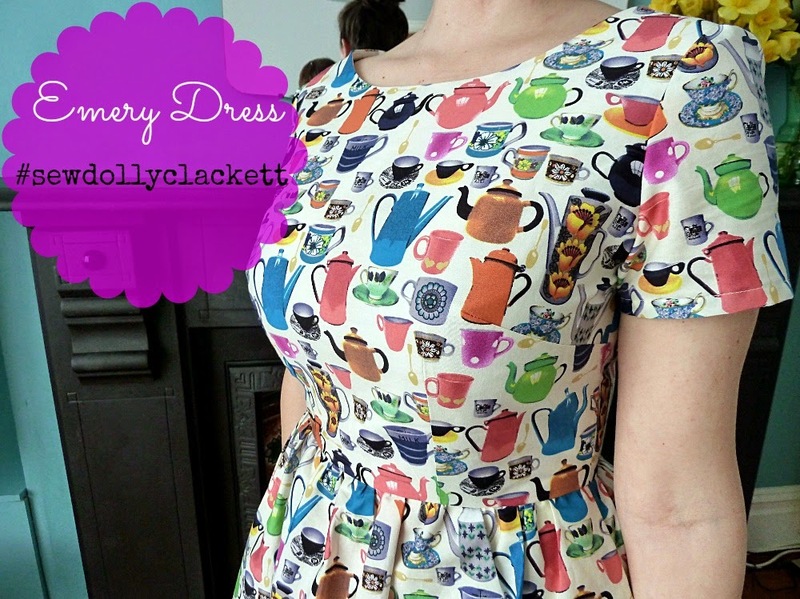 I couldn't stop grinning in my sewdollyclackett kitty dreams dress either - there's something to be learned from that! Thank you Katie and yes, there's definitely a good lesson here! I love love love this dress so much! The print is amazing, it's so super neat and I love the striped pockets with the fabric! I have taken part but I don't think I have much chance against all of the lovely dresses. Thanks so much char, your dress is gorgeous too my dear!!! Seriously cute, I love this print and it looks fabulous as a dress. So neat on the inside too. So many lovey dresses in this competiton. Thanks Louise! The competition has been such fun! That print is so amazing I love teapots. My first job was in a tea shop where they had shelf fulls of old decorative ones and my favourite job was getting them down to clean them. it's lovely! great print. i'm not keen on the lining finish on this either. it seems to give me wrinkles which weren't there before the hand sewing! and the print is so busy you couldn't have avoided jugs on your jugs! Thanks Jo, glad to know I'm not the only one not too keen on that lining method! This dress is so much fun! I know what you mean about the lining - there have been a few times when I thought I was actually stuck in my Emery because the lining was caught in the zip! Thanks Claire and right back at ya for your dress! Silly linings!!! In love with your fabric … one of my favourite Dolly Clackett makes so far! ARRGH. This is too lovely for my eyeballs!!! I am sure you could tweak the lining design a little for your next one. Now I'm off to lie down as I'm overcome with dress envy. Haha, love that you need a lie down now...thanks beautiful! This is my favourite DollyClackett entry so far! :) A dress with teapots all over it....can't argue with that! Wow that looks fab, I totally love the pockets! I love this dress, and your tea set is so pretty too! Waaahhhh!! Marie!!!! I LOVE LOVE LOVE this dress! I am a total tea maniac and am head-over-heels for your lovely creation! Haha, thank you Sarah...genius idea my friend! Oh I love this so much!! That picture of you cracking up with your tea set is PRICELESS!! You're just too cute for words! Thank you Sallie, you're pretty darned cute too! Gorgeous! This is so pretty! Fantastic! A gorgeous style which really suits you and an incredible print - basically, a great Dolly Clackett dress :) Loving the range of entries! Thanks a million, loving them too! How absolutely adorable! And, the photo with the green teapot and cup is such a cute way to play up the theme of the pattern. Also, I think you have a lovely smile! I love it! The fabric is so fun, and Emery is definitely a winner in my book. I know what you mean about Dolly Clackett style dress making you feel happy - mine just makes me smile whenever I put it on! Thanks! Yes, Emery's a keeper and #sewdollyclackett is good for our health methinks! I am in love with your fabric!! You are so fabulous in these photos, especially with those divine shoes and that green teapot - perfect :) Marvelous job! Thanks so much Meg, you're such a honey! Just gorgeous! And I love the 'jug' placement! Hehe, made me laugh when I realised too! I'm just relieved the milk jug isn't any bigger! Ohhh!! So cute!!! love the fabric!! This is one of my favourites, it's gorgeous! This dress is amazing! Do you know what brand/make of fabric it is please? If I don't have some of this fabric in my life I think I'll sob! Thanks! Yes, I know exactly what you mean about the A-line gathered skirt...it's genius! I LOVE this dress! And the pocket detail - swoon. And I love seeing your smile. Dolly Clackett would be proud. Oh is that ever an adorable Emery!! Doing Roisin proud once again and also making me kick myself once again for not getting a dress done in time, dangit! But back to your wonderful tea time dress, the print is so perfect and I LOVE that your contrasting pockets are stripey, how fun. It's a super style on you and I love it with those shoes. Your 30s tea set is lovely, too! Thanks a million Tasha! I'm sure you could have pulled out one of your existing makes and claimed it for the competition...you have such a great eye for fun prints and colours! That fabric is too fun! Great dress. SOSOSOSOSO CUTE! Love the teapots, and perfect props!!! I think this is my favorite entry.That fabric is amazing and you look absolutely adorable in it! My goodness, that dress is so CUTE! I love the pocket detail. I had to keep scrolling up and down to keep looking at it! Aaaw, thanks a million Debbie! MARIE. This is PERFECT. I love love love love LOVE this dress! You look pretty as a picture- love your beautiful smile! I don't even have the words for how much I love this dress! Beyond fabulous. That fabric is amazing! Gorgeous, I love that print and it seems I really must get myself that Emery pattern!! Yep, it's a great pattern! You look beautiful! I love the fabric you picked. What a perfect roisin inspired dress. Gorgeous, Gorgeous, Gorgeous - as ever! Your stripey pocket lining photo made me smile :) Love all your photos and the fit of this creation! Thank you muchly, very kind of you! I'm so late to this party but just had to agree with everyone else and say - gorgeous dress!! I love it so much, and your photos made me giggle. Totally in love with your stripey pockets - fab!!! Dang, you are good at setting in sleeves! Teach me your ways! Mine always pucker and I have to unpick the basting stitches 75234503452 times. This is so gorgeous. The shape is lovely on you and that fabric's pattern is AWESOME! Want!